Klipsch launches £520 Heritage Headphone Amplifier | What Hi-Fi? And very smart it is too. It’s been well over a year since we first clapped eyes on the Klipsch Heritage HP-3s, supposedly the company’s “most impressive” headphones to date. They’re now available in the UK, priced at £1300, and alongside them is the Heritage headphone amplifier, also launching in the UK now and priced at £520. Naturally, the Heritage headphone amp can work with other headphones - but Klipsch says it's designed to get the very best out of the HP-3. Driven by a high-resolution ES90128K2M ESS Sabre32 Reference DAC, it can handle 24bit/192kHz PCM and 11.2MHz DSD files. Two headphone sockets, and balanced XLR and switchable RCA outputs enable it to be used either with headphones or solely as a DAC in a stereo system. They’re joined by optical, coaxial and line-level inputs. 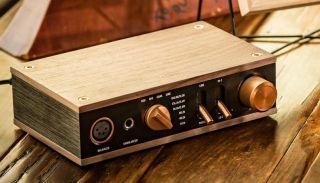 The Heritage headphone amplifier’s aluminium casing is finished in walnut, with anodized aluminium switches and knobs contributing to its distinctive look.